It is hoped that more information can be added to this page as it is discovered. If you have information to add or correct, or photographs of these or other people who served on the Home Front at Denbies or Ranmore Common, please contact us. 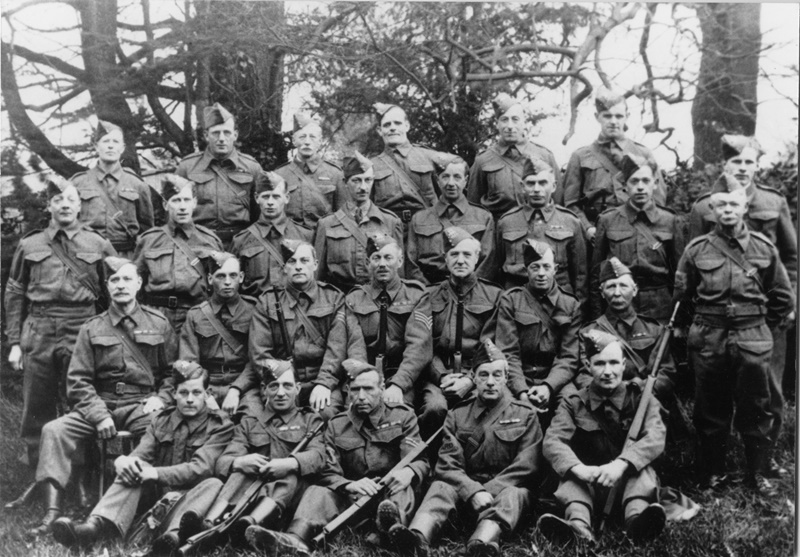 When the Denbies Home Guard platoon was formed, the gamekeepers (Walter Hitchcock, Arthur Walder and George Mackenzie Mackay) would take along their guns, the others having to parade with pickaxe handles (very “Dad’s Army”), according to George Mackay. He also said that their code name was “The Blackberries”. The photograph below shows some who served (many wearing medal ribbons from the Great War). Many were identified by George Mackenzie Mackay not long before he died in 1999, and we are very grateful to his daughter Norma Murray for passing them on to us. Other names were supplied by the late Elsie Margaret Royal (who died in 2006). and all names were examined in 2017 by Elsie’s sister Rene Mackie nee Royal, to whom we also extend our thanks. It is natural that so many years after the event that there are discrepancies in the identity of a few of the men, so, where these have occurred, we have inserted both suggested names to a man’s picture, and indicated by the initials EMR and GMM the source of each identification. There are also, a few duplications of names, eg Haynes and Woods, and it is not certain whether these are the same man included twice in error, or two separate men with the same surname, probably family members. Especially In these instances it would be wonderful to know which of the two names is the correct one, and also to put names to the few faces still labelled as “Unknown”. So if you know, or think you know, who they are, or have more information about the named men, please contact us. James (“Jim”) BUCKLAND, younger brother of Frederick Buckland of the War Memorial. Served in The Queen’s (Royal West Surrey Regiment) in WW1, according to his daughter Muriel Rice. Lived No 2 Dairy Cottages. Buried 1966 aged 68 with wife Margaret Annie (1970 aged 74) in St Barnabas churchyard (grave D15). Alfred R. HAMILTON, carter in 1939 Register, b. 1900, married Alice L.Wakeford, living 1 Bakehouse Cottages, Ranmore 1939. Died ? 1966 Midhurst, Sussex. 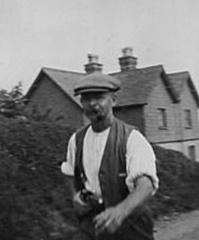 Walter HITCHCOCK, gamekeeper 1911, Estate bailiff towards the end of his working life. No. G 2323 , Quarter Master Sergeant of The Queens. prev. reg 8 RWS . 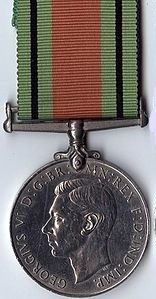 British and Victory Medals. A/WO. Cl II. Married Rachel Eliza Jobson 1917. During the war he and his wife lived at one of the two Fort Cottages, as they had since 1919, still being registered there in the 1945 Electoral Roll. He is reputed to have been very military-minded, so maybe it suited him to live in a one-time military establishment. Later lived at Keepers Cottages, and then Old Dene Cottages. Buried 1983 aged 91 with wife (1987 aged 98) in St Barnabas churchyard (grave Q9). Fred(?erick) HODGKINSON, woodman, later farmworker, b. 1883 Wotton, Surrey, 1891 living “Crabtrees, Mickleham” (probably Crabtree Lane, Westhumble); 1901 Bakehouse Cottage, Ranmore, woodman, nephew to Alfred (a carter) and Jane Pitt. Married Eliza Louise Bailey (fisherman’s daughter) 1909 St Barnabas,, residence of both given as Ranmore, Living 1911 Ranmore Common with wife and child, general labourer. Probably the H.Hodgkinson in the Harvest Home photograph of 1934 (the H being a misprint). Worked with George Royal (below). Living Garlic Cottages at death. Buried 1954 aged 71 in St Barnabas churchyard (grave J19) with wife Eliza Louise (1963 aged 79). Harry Braustyn HYLTON-FOSTER (later Sir Harry), barrister, MP from 1950. Knighted 1954 on becoming Solicitor General. Speaker of the House of Commons 1959 until sudden death in 1965. His wife Audrey was given a life peerage (Baroness Hylton-Foster, DBE) in his honour. Lived Old Dene, Bagden Hill, Westhumble, also Westminster at death. Buried 1965 aged 60 with his wife (2002 aged 93) in the churchyard at St Barnabas (grave H15) . ISAAC LUFF (senior), member of an old Ranmore family. b. 1881, son of Henry and Jane Luff of Badgen Farm. Pony boy at Denbies at the age of 12, then worked in Denbies Gardens. Married Amelia Dennis, lived Rose Cottage, No 2 Lime Tree Cottages, and West Cottage (at death). Clerk of Parochial Church Council or Verger 1901 to 1957. Buried 1955 aged 74 with his wife (1963 aged 81) in St Barnabas churchyard (grave L15) See They Also Served World War 2 for his son Isaac Henry Luff (junior). George Mackenzie MACKAY (MBE), assistant gamekeeper, then estate worker working with cows and other animals. A renowned shot. Born Caithness, Scotland 1911. Married Florence May Shelton. Lived Old Dene Cottages, then Lime Tree Cottages, Fort Cottages (briefly), then Rose Cottage before moving to Pinehurst, Box Hill. Buried 1997 aged 85 with his wife (1999 aged 88) in St Barnabas churchyard (grave Q23). Nelson MOORE, electrical engineer (presumably to Ashcombe Estate – “Private Power Plant” in 1939 Register), Widower in 1939, when living No 2 Station Terrace; address on death “Denbies”. Buried 1973 St Barnabas churchyard (aged 91 on burial register but ? 93) (grave H 17). George Herbert ROYAL, farm labourer, b. 1883, wife Emily Louisa nee Hedger, six daughters. two sons. Served WW1, Private T/205749, The Queen’s (Royal West Surrey Regiment), previously 6107, 1/4 RWS. Served India, Living Garlic Cottages at death. Buried 1972 aged 88 with wife (1964 aged 81) in St Barnabas churchyard (? grave I 18). Arthur Albert WALDER. senior gamekeeper at Denbies. Living No 2 Yew Tree Cottages at death. Buried 1970 aged 86 in St Barnabas churchyard (grave H 20). Sidney Charles WESTBROOK, head gardener, Ashcombe Estate, b. 1899, West Dean, Sussex. Living North Lodge, Ranmore (1939 Register). Married Frances Helen Hamlin, d. 1988 Grantham, Lincs. Ranmore Common saw some wartime activity. A bomb fell near Dairy Cottages and there was a gun pit near North Lodge, the entrance to Denbies off Ranmore Common Road. There was a searchlight near Lonesome Cottage. On the western edge of the Common in a barn at Dunley Hill Farm a sentry box was discovered, and there are still remains of Nissen huts in the fields. Units of the Canadian Army – possibly the 6th Armoured Regiment (1st Hussars) – were encamped over most of the North Downs including Ranmore in preparation for the invasion of France on 6th June 1944 (D Day). When they left Ranmore, they did not take with them some of their equipment which was not serviceable including tanks and troop carriers. 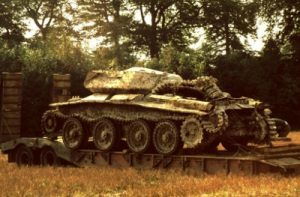 In the 1970s a cruiser tank (the “Covenanter”, the first such tank to be given a name) was dug up on Bradley Farm, then a pig and cattle farm, now Denbies Wine Estate vineyard. It was only ever used for training because by 1943 its armour was considered too weak to deal with new German tanks. It was one of four tanks buried when the Canadian Army left in 1944. 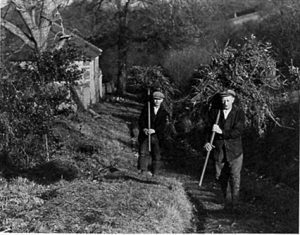 Former gamekeeper and Estate bailiff, Walter Hitchcock (see Home Guard picture above), identified Its place of burial. It is now in the Army Tank Museum at Bovington. In 2017, five feet down in the chalk rubble under Denbies Wine Estate vineyard, the burial site of a second Covenanter tank was identified by Manchester tank enthusiast Rick Wedlock, using his magnetrometry equipment and a small digger. The digger’s bucket first struck the gun turret, then uncovered the front armoured louvres and the driver’s observation hatch. 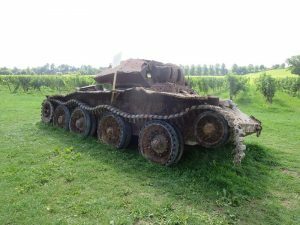 This second tank was excavated on 23rd May 2017, surprisingly still with a working wheel and original 1940s fuel. After six months on display at Denbies, it was removed for restoration by Rick Wedlock, although it will return each year on the anniversary of its excavation so its progress can be reviewed. 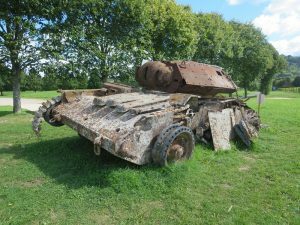 Possibly there are other tanks still buried, as well as some other military relics.